Air raid sirens sound in northern Israel, Patriot missile fired from Tzfat. Air raid sirens sounded Monday morning in northern Israel, reports said. The sirens sent residents of Tzfat, the outskirts of Mount Hermon, and the regional councils of Merom Hagalil, and the Upper Galilee, running to bomb shelters. The Golan Heights was affected as well. No rockets have been spotted in Israeli territory. 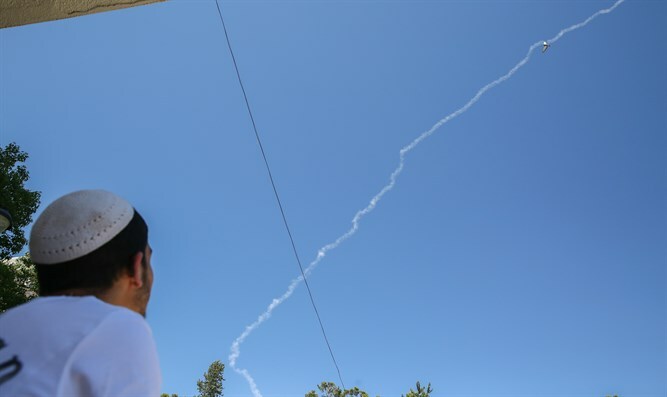 A Patriot missile was fired from Tzfat to intercept the incoming missile. An IDF spokesperson said the sirens were a result of the IDF identifying missiles launched as part of the Syrian infighting. "Because of this, two 'David's Sling' missiles were fired at the rockets, out of concern that they might fall in Israeli territory," the spokesman said. "The Syrian rockets were fired during Syrian infighting and they fell in Syrian territory." "No one was injured and no damage was caused." David's Sling was previously known as "Magic Wand."